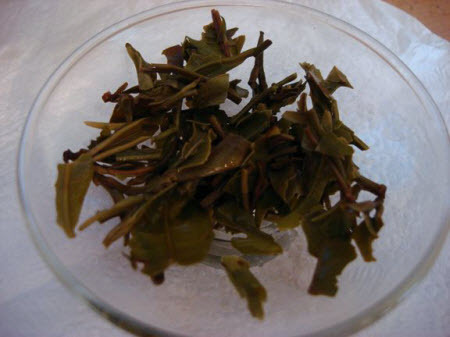 Basically there are two types of white tea leaves available to the consumer: the kind with long, thin silvery (sometimes downy) leaves, and the kind with leaves of varied sizes and colours, sort of like what you might find on a forest floor. The catalogue photo for this tea depicts the former, while these Darjeeling white tips are definitely in the “forest floor” category. So I was somewhat confused. As a matter of fact, I thought perhaps they had sent me a pai mu tan (or bai mudan if you prefer) tea, which generally has this “forest floor” appearance. I asked my esteemed editor to verify that the tea sent to me for review was indeed the Darjeeling, which she did. 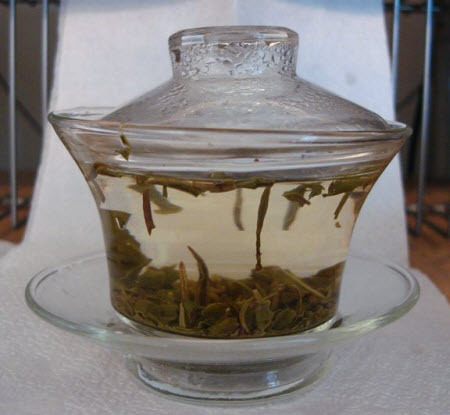 I sampled the white tips in a six-cup and a two-cup teapot, and then in a gaiwan, trying to discern any hint of the typical Darjeeling muscatel taste or aroma. Sorry to say, I didn’t find it. What did come through was a nutlike quality in both the nose and the cup, seguing into the gentle floral sweetness that renders white teas so enjoyable. And that heretofore I had considered typical of a pai mu tan tea. Bottom line is that while this tea did not look the way I expected, and didn’t exhibit the taste or aroma I expected, it did produce an enjoyable, respectable cup, and at a very reasonable price. Although the photos show it steeping in a gaiwan, I recommend using a teapot and staying on the short end of the steep, as this tea starts to get bitter after five or six minutes. Well, as far as I understand Darjeeling, Estate & its elevation carries extra value. Why not check the same with your vendor. Which Tea Estate tea is this?